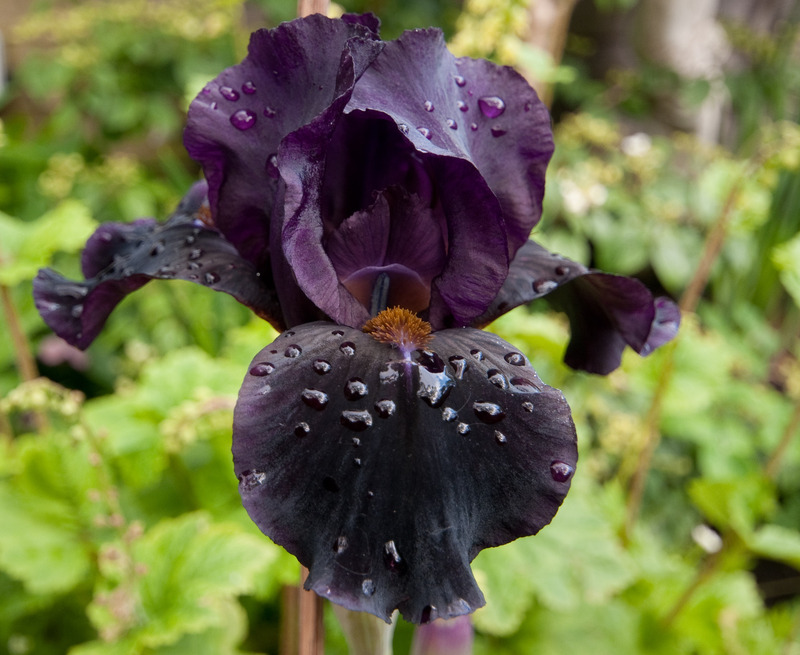 I wanted to share my latest ‘treasure’ for the garden – this is Iris ‘Sinister Desire’ – which is perhaps rather a forbidding name for such a beauty. If you read my last post you will know one of my plans for the weekend included the local NCCPG plant fair, and I hoped my favourite Iris nursery would be there. They were, and they did not disappoint. Now I’d spent time looking out of my kitchen window at the garden before heading off, planning in my mind what colour iris I wanted, what height and so on. Naturally once I was there I had to shelve my plans because there were no tall pale pinks only dwarf ones; tall Iris are later in the season I learned, so another plant fair beckons. So, I was looking at the Intermediate ones, which are about knee high. This lovely dark purple, almost black in some lights, looks lovely against the acid green of the new growth on the Buxus and the Tellima which is the background in this image. Since my garden has been re-designed I’ve had to totally change my plant buying habits. Previously, being a bit of a collector I would buy single plants, so I could get more plants for my money – but the result was a bit of a pin cushion, and lacked impact. So, my garden designer had firm words with me about this, and now I buy to plant in groups, usually in threes as the garden is quite small, and I get an immediate impact, but then as things bulk up I can still divide them and so increase the spread of the planting. Therefore, on Sunday, rather than buy three different colour Iris, as I would probably have done in the past, I chose three of the same – and this evening I’ve planted them by the side of my path, but in an asymmetrical shape, two on one side, one on the other – so as to bring the planting either side of the path together. I’ll keep you posted on the success, or otherwise. The rest of the plan is to now buy a further variety and do the same, but the opposite way around. Whether or not I achieve this in this planting year remains to be seen – I need to make a bit of room – already! This entry was posted in Creating my garden, In my garden and tagged cottage gardens, English gardens, gardening, Iris. Bookmark the permalink. A great name for a great bloom! !